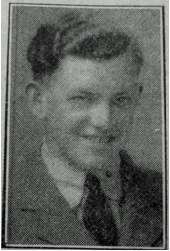 Mr and Mrs Dean, 4 Forest-rd., Quorn, have received news that their son, Flight Sergt. Peter Dean is missing. He was educated at St Mary's Catholic School, Loughborough, and Quorn Grammar School. He joined the RAF in 1936.